When a business is looking to advance in the current modern digital environment, there is a fundamental need for strategic speed and flexibility in order to remain compatible with how the digital environment operates. Our team uses an agile approach when working with clients and we report tangible work progress in weekly iterations. This approach ensures that priorities remain in sync with any new developments or discoveries that surface - preventing any wasted time and resources. As we move through each iteration, our team follows a proven intelligence cycle to acquire and analyze any pertinent information. These data-driven insights are key to ensuring that priorities remain on a predictable pathway forward - achieving mission success as quickly and efficiently as possible. While all items listed hold value in their own right, our methodology has effectively shifted the focus of business interactions from being a dry mechanical event into being a fluid personal experience that is more suited to keep up with the fast-paced digital world we operate in. By definition, "agile" work is accomplished in small digestible sections. These sections are often referred to as “iterations”. Each iteration is typically pegged to the duration of a single work week. Upon the conclusion of a project iteration, the team meets with key stakeholders to review and critique the progress for that iteration. Insights gained from the collaborative discussions about an iteration are used to determine the next steps in a project. 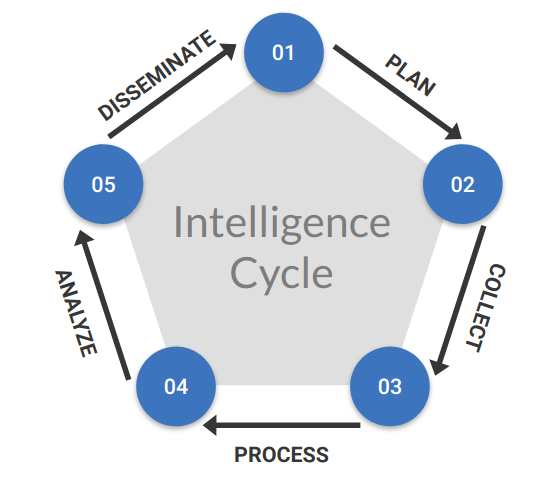 Our team uses a proven intelligence cycle as a foundation to how we approach our work. This data-focused method is based on the same intelligence cycle that is used by cybersecurity companies and government intelligence agencies across the world. 1. PLAN: Identifying the requirements and defining the focus of the intelligence activities for the current cycle. 2. COLLECT: Assemble the information and data necessary to fulfill the requirements of the current cycle. 3. PROCESS: Curating the collected information and formatting it into digestible data sets. 4. ANALYZE: Forming relevant conclusions and generating reports of the insights that were discovered. 5. DISSEMINATE: Formally communicating the reports and key information that were assembled during the intelligence cycle.